"The book analyzes over 120 money-game checker-play problems, taken from real games. A nice feature is that all the positions are collected at the front of the book so that you can quiz yourself before you turn to the main part of the book for the analysis. What makes the book outstanding is the quality of the analysis. During beta testing, I worked very hard to try to bust the analysis. Did Black miss a cube turn before the roll? Do the "explanations" hold up if we alter the position slightly (this is where I put in the most effort, trying to find variants for every position)? Does the analysis consider every play that a human might make, or only the plays that are near the top of the bot's list? This book belongs in the library of every serious backgammon student. "Timothy Chow, May 2011. "What's Your Game Plan? is a collaborative effort by a pair of well-regarded author-analysts. This book has a number of things going for it. It is focused. Hickey and Storer chose positions for this book that fit specific requirements. Each position is treated in the context of a money game; all problems are checker play problems; all are mid-game problems. There are 122 problems, each one getting at least two pages of analysis. The authors did extensive rollouts and provide two tables per problem using the rollout data, one of equities, the other of game-winning chances. "Jake Jacobs, Flint Area BackgammoNews, May 2011. "This exemplary work addresses the meat-and-potatoes of backgammon with a terrific array of problems. It is a treasure trove of analysis wrapped in a flowing fabric of creative metaphors, playful humor, and well-placed "insider" jargon. The positions are framed individually with central questions to consider, solutions, and explanations. The problems lead naturally to these critical middle game questions: (1) What are my current priorities? (2) It it time to address my biggest concern? (3) Should I leverage my assets? (4) Where is the game headed and what is about to be the deciding theme? (5) What should this pip count be telling me? (6) How relevant is the cube? "Wilcox Snellings, Chicago Point, June 2011. 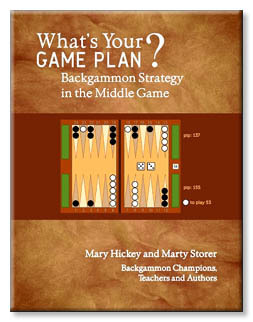 AUTHORS: Mary Hickey learned to play backgammon at the very end of the 1970s craze, then dropped out to pursue other interests and raise a family. She returned to the game at the end of 1995 and has been playing, teaching, and writing about backgammon ever since. Mary began working with game-plan problems many years ago, and published several of them in 2006 on the GammonLife.com website. As of this writing, this site is still active and includes Mary's columns, along with other backgammon news and information, tournament reporting, player profiles, and photos. Mary also writes about backgammon for the online magazine GammonVillage, where she continues to report on live tournaments and share the occasional tutorial. Her series of columns was released as a book on CD in 2010, and the columns plus her other work for them continues to be archived at the GammonVillage.com website. She has also published numerous articles in the Chicago Point, including several for the "Your Move" column. Her work for the Flint Area Backgammon News includes quizzes, articles, and book reviews. She was also a contributor to the recently discontinued Hoosier Backgammon Club Newsletter. Mary's other current writing projects include some speculative and experimental fiction, a book about the experience of moving from the city to the country, and a book about time management. She is the author of a book about Mary, the mother of Jesus, title Arise and Call Her Blessed, published in 1999 by Paulist Press. Mary Hickey plays online at FIBS, GridGammon, and Safe Harbor Games as "mamabear." She also teaches the game live and online. She lives on a "mini-farm" in central Ohio with her husband Bob. Marty Storer has been playing backgammon since 1975, another victim of the 1970s craze. He remembers playing non-stop for most of the following decade, after which marriage and family and software engineering jobs intervened. He moved to New England in 1991 and began to frequent the super-strong New England Backgammon Club. He won the inaugural American Backgammon Tour in 1993, helped by his victory in the star-studded Boston Open. He won two more ABT events the following year. By 1995 he was ranked 13th on Kent Goulding's International Rating List. At times he's been the highest-rated human ("mws") on the First International Backgammon Server (FIBS). Though Marty now plays in only an occasional tournament, over the years he's found time to teach and analyze backgammon. In 2005 he published Backgammon Praxis, a two-volume analysis of three matches played by Malcolm Davis. Praxis has won high praise from such luminaries as Neil Kazaross, Paul Weaver, John O'Hagan, Matt Cohn-Geier, Tom Keith, and Chris Bray (writing in both The Independent of London and Backgammon for Dummies). See www.fortuitouspress.com for more information. Marty has written articles for the New England Backgammon Club's newsletter, the Chicago Point, and the Italian magazine Il Backgammon. He has been a frequent contributor to Kit Woolsey's GammonU/GammonOnLine forum, as a member of the Masters Panel as well as the author of one major article and many regular postings. Marty also contributed to GammonVillage, including a detailed analysis of a Senkiewicz-Tardieu match. This article is still referenced often by serious students of the game. Both authors recommend GammonVillage highly as an almost inexhaustible source of backgammon news, instruction, and information. Marty likes to style himself the Undisputed King of Anagrams, and maintains an extensive private collection of those fascinating permutations. His more minor hobby is genealogy, where his research has discovered that he's related to absolutely everyone. Marty Storer lives in a white-picket-fenced New Hampshire house with his wife, three children, three cats, two dogs, two rabbits, and burgeoning collection of backgammon bots.